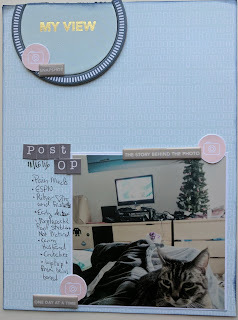 Today I'm sharing a layout I did using the Ali Edwards Lens kit. I took this picture during my surgery recovery when my nurse was keeping an eye on me. I knew this kit would be perfect for getting this story told. I started with an old b-side from Studio Calico's Atlantic collection and blue the big chipboard pieces to the top. I cut the pink cameras from one of the 4x6 cards and used words from the kit around the page. I used some old block letters to write out a title and then jotted down the things in the photo and it all slants to the right because straight lines are hard. It was an easy to put together the page and is getting my stories told and into albums vs photos and product stacking up in my craft space.